Fall is in the air, to me that means perfect weather for a nice blowout!! Brush up on your blowdrying skills with me!! 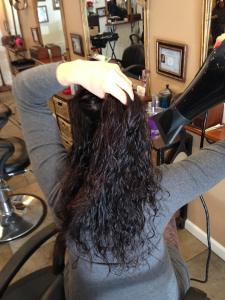 This time of year, we tend to be blow drying our locks much more often than in the warmer months. Our hair can take a beaten with all this extra heat being applied. So, for that reason, I would like to share some blow drying tips with you. Hopefully this step-by-step guide will work out any kinks.. in your routine that is. You will need: Blow dryer with nozzle attachment, round ceramic brush (size of brush depends on length of hair), smoothing cream or leave-in conditioner, and finishing oil. 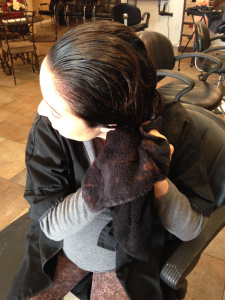 Step 1: After showering, blot hair dry with a towel. Try not to rough up your hair too much as this will cause unnecessary frizz in the hair. Rough dry your hair with the blow dryer and just your hands. For normal hair, remove 80% of the moisture. For wavy/curly hair, remove 30% of the moisture.